Today I'm taking a look at the recently launched Folomov EDC C1. This brass bodied light uses a high CRI emitter and a rear e-switch. Folomov is a relatively new company, but they have made quite a few unique and interesting products already. This sample was generously provided for review by Illumn. At the time of writing, that's the only place to pick this one up - click here to get one for yourself. 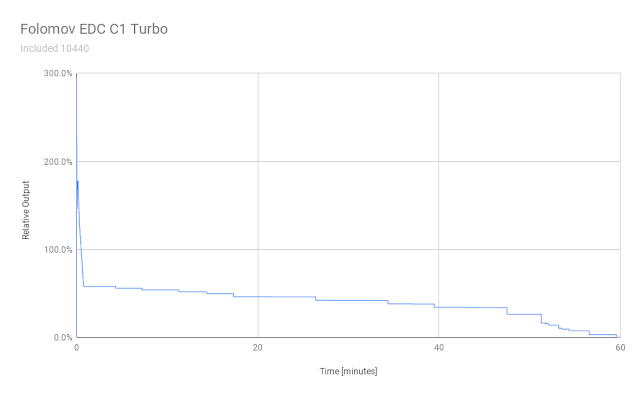 Unfortunately, the sample I received managed to cook it's LED during the turbo runtime test. The runtime was the last step in my review, so the text below has been edited to reflect this. More unfortunate still, I am not the first to experience this issue - Zak noted the same defect in his review. I know other reviewers have received samples that didn't have this issue, and I know Illumn is manually reviewing each light and working with the manufacturer to make sure no defective units are shipped to paying customers - but for now, I would not recommend purchasing this light. This is a fantastic little light with a few drawbacks. There's a lot that makes it completely unique: tail e-switch, tiny package, high CRI E21A, brass body, and warm 3000K tint. Even with the UI quirks, I would definitely recommend picking this light up. I measured the light at about 67.5 mm long, and 12.9 mm in diameter. It weighs in at 26 g without a cell, or 35 g with the included 10440. This is the first light that is small enough for me to actually keep in the coin pocket of my jeans. Here it is compared to two other AAA sized lights, the Lumintop HLAAA 2.0 and the BLF-348. It's a bit longer than the HLAAA, which actually has a bit of extra length in the image as the tailcap wasn't on all the way - but overall, it's extremely compact. This light is made entirely of brass, but with an interesting coating on it. The finish is smooth, and seems to be some sort of clear coat that gives it a bit of a bead-blasted look. The coating also means that the light won't show a patina over time like bare brass, and it doesn't have an odor like bare brass. If you prefer a bare brass finish, it shouldn't be too hard to sand off the coating - I know some owners have already done the same. The head of the light has a flat bezel that doesn't protrude much at all from the glass window of the light. There are 6 small grooves cut into the head. These are probably mostly for aesthetic purposes, but they also add some grip and a touch more surface area for cooling the head. Below the head, the body has a small indentation where the clip attaches. The top edge of this is bare of coating. This are was probably masked to make sure the coating didn't jam up the threads, and the mask just went a touch too low. It's not very noticeable as it's tucked away below the head. The rest of the body tube is a plain, smooth cylinder. One side has the brand engraved, and the opposite side has the model and a stylised bee(?) engraved. The tailcap is also smooth and cylindrical, with three notches at the end to help with grip when removing and replacing the cell. There's a small chamfer on the edge, and the grey button boot sits slightly proud of the end of the light. Even though the switch protrudes, the light is capable of tail standing - though it's not very stable. Inside the tail, the threads are thick and square cut. The threads are also bare, which means the light can not be physically locked out. There's a single small spring serving as the negative cell contact for this light. The positive cell contact at the head of the light is a small brass button. This is a small light, and it fits in the hand well. It's small enough that when holding it with an overhand grip, I had to take care to push the light forwards so my pinkie wouldn't block the output. Even though the surface is smooth, the light weight meant that I had no issues holding on to it. Additionally, tail switches are always great for ergonomics - they're easy to locate, easy to activate, and I find they turn on in my pocket less often than side-switches. The friction fit clip comes installed on the light, and works only for head-up carry. The carry isn't particularly deep, leaving about 8 mm protruding. I think the decision for head up carry was a good one - I rarely use a pocket clip on tiny AAA-sized lights like this, and the orientation makes it suitable to clip to the brim of a hat for use as a headlamp. This light actually has two mode groups - "Illumination" and "Tactical". To switch between the two groups, tap the switch quickly 7 times. The UI is fully described in the manual and on the product page, but here's a rundown of some of the more common operations. The full UI includes features like strobes and timers, but I've left those out of the lists below since the manual describes them just fine and I'm not ever likely to use them. The long press to turn the light off is a bother, and I really don't like the mode order - I never remember what mode my light is in, just that I need more or less of it, and prefer a consistent action to get that result. Even with these annoyances, it's easy to see how flexible having an e-switch at the tail is, and it's a worthwhile trade-off for me. I do hope that Folomov can improve this UI on a future iteration of an otherwise amazing light. I am certainly not a 'tactical' user, and I would usually ignore this mode completely, but on this light it has some advantages. Momentary usage is extremely handy, and this mitigates the long press for off issue. Since the light is only 240 lumens max (according to the measurements on the product page), this is a reasonable setup. 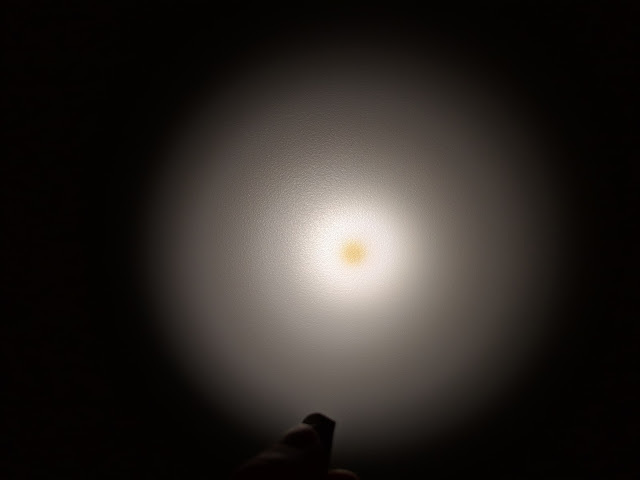 In fact, I think using this light in momentary mode gives you a better beam and better interface than the BLF-348 did. 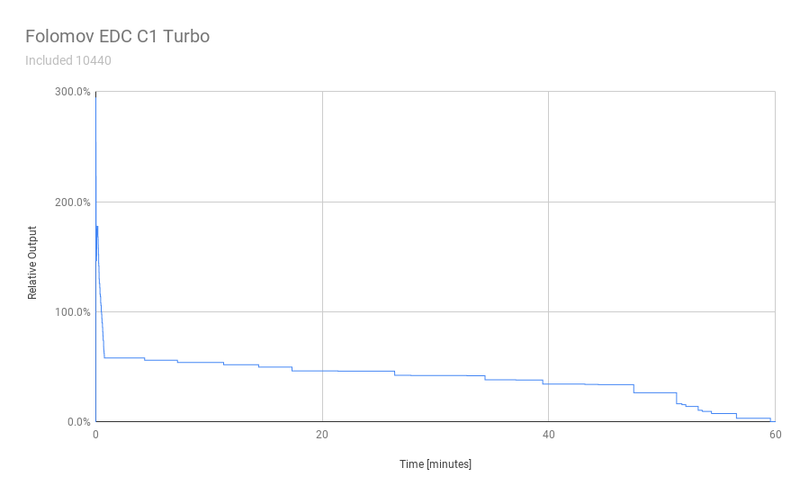 I can no longer suggest use in this mode, since the turbo is capable of cooking the LED. It's also worth noting that some other reviewers with better equipment have measured the moonlight mode at 2 lumens, which is in fact far higher than the advertised 0.5. It's unfortunate that the manufacturer didn't meet their claims, but I have no issues with the moonlight level as is. One of the major draws of this light is the E21A. This is a pretty new LED, and as far as I know this is the first production light to use one. The major draw of this is that the LED measures at over 95 CRI, making it extremely accurate at reproducing colors. It's also domeless, which gives the beam a very consistent tint. Finally, the E21A chosen for this light is extremely warm at 3000K. That may be a bit too warm for some people, but I really like it - and I think it goes great with the brass body of this light. The warm tint is still nice, but my light now has an unfortunate dead spot in the middle and is not really usable. I've done my best to capture this in a photo, but it's larger in person. The light is powered a single 10440 cell. It ships with an included cell with a micro-USB port for charging. Even though the cells are the same size, this light will not run off an AAA. The included cell measures 10.5 mm in diameter by 44.1 mm long. Runtime shows the light drops down from it's initial output extremely quickly, and is nowhere near the initial output by the time the 30 second mark is reached. The remainder of the run tracks cell voltage downwards. This is the test that cooked my LED, so I can't be sure the results would be the same otherwise. The light itself doesn't have integrated charging, but the cell it ships with does. This is done by plugging a micro-USB cable directly into the port on the cell - which I have to say, really puts the diminutive size of the 10440 into perspective. 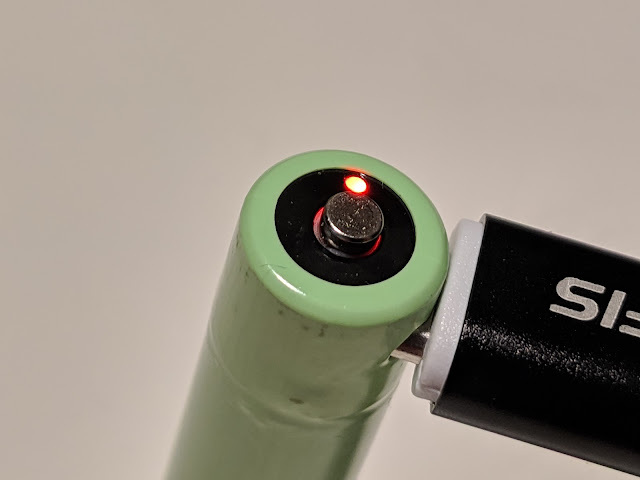 When the cell is plugged in, a small red indicating LED comes on on the positive end of the cell. When charging is complete, the LED turns green. Charging of the included cell drew about 0.3 A over the micro-USB port, and shows a good CC-CV curve. This small cell will charge from empty to full in under an hour, which is convenient. My sample burnt itself out - I do not recommend this light until this issue is resolved.